The speed difference of USB Flash Drives that support the USB 2.0 standard can be more than 15 MB/s with maximum speeds of about 30 MB/s for fast drives. That's still less than modern hard drives are capable of but a lot better than a few years ago. I think it's really astonishing that there are only a few recent performance comparisons of USB flash drives available on the first results pages of Google. A recent (another one) comparison from May 2008 that tested seven USB flash drives showed differences of more than 15 MB/s between the fastest and slowest drive while copying files of a certain size. If you already have an USB flash drive and want to know how it compares you can test the performance of it using the free version of HD Tune which can benchmark USB drives among other things. The free version will only test the read speed and access time but it should give a good impression of the capabilities of the device at hand. To make the test accurate you should set the test speed to Accurate in the benchmark options. The last two steps are to select the USB flash drive from the pulldown menu at the top and to click on start to start the benchmark. Those speed differences are really interesting. It's probably a good idea to research USB flash drives extensively before buying one. What's your experience with those drives ? The speed of drives has improved a lot with the release of the USB 3.0 specification. USB 3.0 drives are compatible with USB 2.0 ports as well, which means that you can't do anything wrong when buying such a device. You won't notice any speed gains though if you connect an USB 3.0 drive to a USB 2.0 port. Note that speed differences exist between USB 3.0 devices as well. While they are usually a lot faster than USB 2.0 devices, the same benchmarking options apply to these newer drives as well. While it is usually not an option to test multiple drives before you buy one, unless you work in a PC shop or environment were you can do so, it is important to make the right buying decision that is not only based on price but also performance of the drive. Check out this USB 3.0 benchmark comparison on Tom's Hardware from 2013 for example to get an idea of the speed differences of USb 3.0 Flash drives. 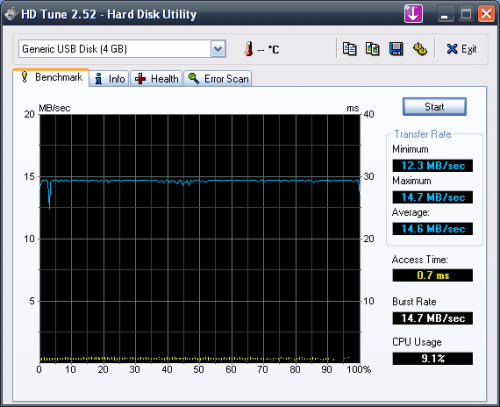 I had few high speed flash drives (apacer, corsair) until I bought 1.8″ external HDD. Advantages of flash drive (size, compatibility) just can’t beat 40-100Gb capacity with times better price per Gb. Is there something that will test SD and SDHC cards? My latest SATA drive shows around 95Mb read speed (of course real performance will be lower), that’s rather more than 30MB/s. esata only had enhanced signal strength and modification to allow multiply devices on same port, no changes to data rate.